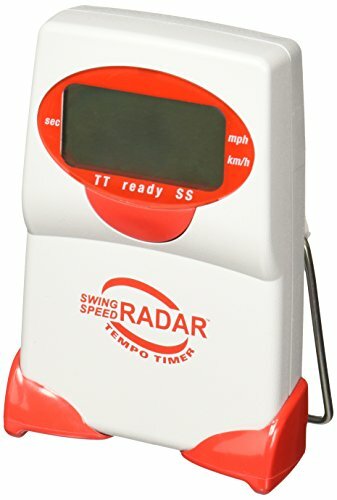 Swing Speed Radar with Tempo Timer The Swing Speed Radar with Tempo Timer is a small, microwave Doppler radar velocity sensor that provides the swing speed and tempo rhythm for golfers of all ages and skill levels. It assists players in developing /optimizing their swing, and maintaining consistency, by measuring actual tempo time from club takeaway to ball impact at the climax of their forward swing, as well as the swing speed of the clubhead as it approaches the ball. The Swing Speed Radar? with Tempo Timer, featuring simple one-button operation, provides unmatched utility in a single, affordable device. Clubhead speed and tempo are two significant characteristics of a golfer?s swing that must be optimized and controlled if the golfer is to consistently achieve his/her best ball-striking results. Expensive launch monitors costing thousands of dollars, primarily used by well-funded clubmakers, instructors, or pro golfers, generally include these two vital parameters in their measurement systems. However, less expensive devices for use by most instructors, clubmakers, and by the golfing public are limited in utility. Conventional swing speed meters can be inconsistent, unreliable, and complicated to use. Some even require attachments to the club that can change the club swing dynamics. Metronome-type devices can provide tempo time models for the golfer to try to emulate, but the resulting tempo time can only be estimated by comparisons with the model. The Swing Speed Radar with Tempo Timer can be set to measure and display clubhead swing speed alone (SS Mode); tempo time, from club takeaway to ball impact, alone (TT Mode); or both swing speed and tempo time in the Dual Mode, in which the display toggles (alternates) between swing speed and tempo time. The Swing Speed Radar with Tempo Timer is the practical choice of clubmakers and instructors who want the flexibility and convenience of use in the field as well as at their home-based hitting stations. It can be used by golfers of all ages and skill levels, at home or at their practice facilities, as they strive to optimize their swing mechanics and rhythm for their best distance, control, consistency and accuracy. Golfers need to determine the tempo time that best suits their swing rhythm. John Novosel, in his best selling new book "Tour Tempo", points out that most Pro Tour Golfers have tempo times within the range of 0.9 to 1.3 seconds. Ben Jackson, Owner and Head Instructor at the New England Golf Academy, emphasizes the trend for the new, young Tour Pros of today is for faster tempo times. In Ben's words, "Speed is the new frontier!" (Tempo time and swing speed!) Check out your tempo time and swing speed and see where you fit in!! If you have any questions about this product or would like to order by phone, please call us Toll Free at 888-733-8383. We look forward to hearing from you!